In January 2010, prestigious advertising agency BBH London approached Rouge Films and Pyramid Visuals to provide vinyl wraps and graphics for their new Audi R8 television advertisement, having gained notoriety from their experience of working with TV productions on such projects as wrapping the Millennium Building for the Channel 5’s Gadget Show. As an avid car lover and self confessed petrol head, Director Justin Murray was delighted, added to the fact that he has located Pyramid Visuals within Brooklands Park, the world’s first purpose-built motor racing circuit, constructed at Weybridge, Surrey in 1907. The concept and storyline from BBH involved a theme of ‘Beauty and the Beast’, depicting Audi’s brand new R8 Spyder as the beauty surrounded by ‘beasts’ in the shape of some of the most marvellously beaten up old Hot Rods/stock cars in the world. Production company Rogue Films sourced the 22 cars from all over the USA and UK. 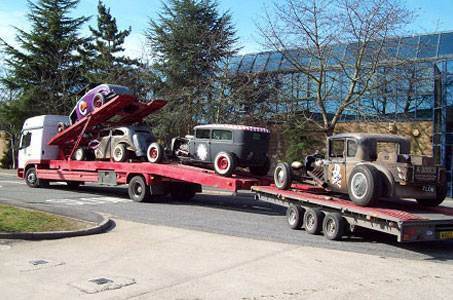 The Hot Rods were then shipped directly to the Pyramid Visuals warehouse in Surrey for the transformation to begin. In an intense race to the clock due to shipping delays, the Pyramid Visuals team of Graphic engineers worked as four teams of two, around the clock for four days to get the cars ready for the TV Commercial shoot. Digitally printed on the HP9000 solvent printers, each car was given a unique and striking vinyl wrap design which was then carefully applied to each vehicle using Avery materials. As the pressure mounted, the Rogue TV crew came to film the preparations and capture the progress of the Pyramid team as they worked their magic, turning each car into a personality. The camera crew have produced a ‘making of the commercial’ documentary, which will be available to view in May on the Pyramid visuals website. It perfectly captures the intensity and dedication of the Pyramid Visuals team to get the job done, perfectly, and on time – and naturally it was great to be part of ‘team Audi’. On the day of the shoot everything was ready and the 4 day filming began. Shooting in Excel London, the ‘Beauty and the Beast’ story involved all the noise and the attitude of Hot Rods, each one carrying its own distinctive design such as a skull and crossbones, or a crazy mouth with big sharp looking teeth, driving furiously around and missing each other by inches. Naturally the Audi R8 glides through the carnage and escaped unscathed, looking like the perfect hero. The Audi R8 Launch advertisement, shot in March is due to screen in the UK during May 2010, was an original concept created by Kevin Stark and Nick Kidney for BBH London, and is directed by Sam Brown from Rogue Productions. Justin Murray, Pyramid Visuals commented. ‘In all truth, when I got the call I was very excited. Working on this type of project is a lot of fun and it’s exactly what we’re all about here, pulling together as a team to get the job done perfectly. We work on many vinyl wrap projects, so we’re used to turning it around quickly and getting it right first time and this proved to be key with the quick turnaround needed on this project. Press Further information on this press release including images, please contact Justin Murray – Pyramid Visuals either by email Justin.Murray@pyramidvisuals.co.uk or 01932 338899.